I was cleaning out an old box of my parents you know the kind, dusty probably never been opened in years and I found a treasure. 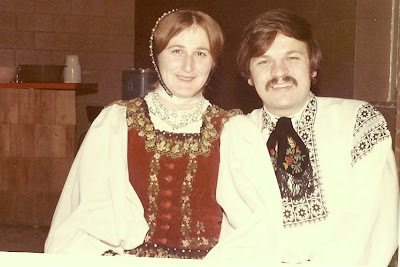 The colour photo is my parents in Saxon Dress. 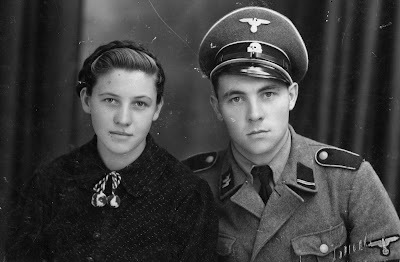 The photo above was taken of my aunt and uncle just before he went to the Eastern Front, and she left for Transylvania. i think it's time for some frames and hanging up on the wall. The dress my mom is wearing is in fact the Sunday dress of the aunt in the above photo. I found by asking some cute and sweet stories of them I never knew. Few months ago I found my grandparents wedding picture the saxon clothes were amazing. In her area it is black and white (Sibiu). yes, this is from just south of Bistrisa, so it's mostly bright read and deep greens.